2017 has been a bad year, healthwise. I hope to restart production in 2018, though ! I would love to hear what you have to say about my products. Here are some of my favorite comments sent in by my customers. 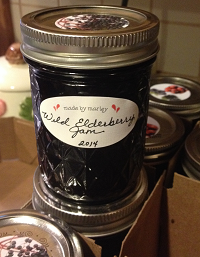 I thought nothing could touch Marley&apos;s Strawberry Rhubarb, and then we opened a jar of this ambrosia, Blueberry & Lemon. I ate an entire pear ginger jam with a spoon. If that&apos;s wrong I dont want to be right. Thankful for 10 years of gluten free baking experience, which allowed me to create popovers out of whatever-the-heck flours I had in the pantry. Thankful for Made by Marley jelly to top them, saved since summer for just such an occasion. Can&apos;t talk, mouth is full of the most delicious jam ever. I need to get bigger jars. And more jars. Man cannot be the live by bread alone, but bread and jam is another story! I just bought your raspberry lime jam at the Shaker Store yesterday. I want to stock up on that jam! I don't want to miss out on buying more before the winter. Your product is excellent. Your Indo Noir Jelly is great. Over the past 2 days had it on a scone with clotted cream, and then on a english muffin with butter, and yes coffee. Wonderful. My husband and I were traveling from NH to Philadelphia and stopped by the O&apos;s Eatery for lunch. I saw your products on the counter and purchased the Balsamic Rosemary and Black Coffee jams. I am in love with the Rosemary. I haven&apos;t found quite the right carrier for the coffee one, but I&apos;m sure I will. 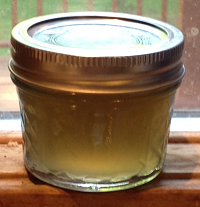 I traveled north a couple of weeks ago and picked up a few jars of Marley&apos;s flower jellies. I was lucky enough to snag a jar of the limited violet, and let me tell you all, this stuff is gold! I am very judicious in my use, because I don&apos;t want to run out as it will be at least another year before I make it to Upstate NY again. It is delicate, and while it goes great with cream cheese on a cracker, I now forego the pairing, as the violet flavor can be overwhelmed. So lately, my favorite use is to spread a thin layer in lightly toasted (warmed really) naan. The fluffiness of the warm naan and violet flavors marry really well! On our way home from a vacation near Northville on Great Scanadaga Lake, we stopped at O&apos;s Diner for lunch. My daughter noticed your preserves on the counter and we bought two. I am not the quiet collector of your ingredients but I do grow tomatoes on our patch of land here in Yonkers and make some of them into tomato preserves. But your preparations are very different and splendidly supple. I write to thank you for restoring the ephemeral joy, not yet lost, to those who in their youth scavenged the hills for the fruit of bushes made into simple delightful, unpretentious, jams. I am happy to be a recipient of your passion to make jams from such wonderful sources of nature. We are enjoying the cherry vanilla jam. Had some of your strawberry vanilla jam last year after purchasing it at the diner. Been awaiting the arrival of this year&apos;s batch with great patience. Your jam saved the day! I had two wicked picky eaters last night as part of the family we had over for dinner. They didn&apos;t like the main course and left it mostly untouched. Then came dessert. The entire jellyroll was consumed with one of the picky eaters asking for 3 helpings! I took your advice on the pear ginger jelly maybe having too much of a kick from the ginger to be widely loved by little ones so I simply added a layer of freshly whipped cream to help soften any bite someone would perceive from the jelly. The cake wasn&apos;t anything special. The whipped cream was freshly made, but again nothing special. It was your jam! The mom was so surprised at how much her kids loved it (and again, picky eaters) and ate it that I gave her your details. Really, really great night. Purchased your strawberry rhubarb jam for my husband while stopping at the diner in Chatham, NY. He said it was the best ever, not overly sweet, tasted the fruit. Hope to do business with you soon. My husband says it was serendipity, making a pit stop at the diner and finding your jams. Thank you. Email me directly at marley@madebymarley.com. You can also find me online on Twitter, Instagram, and Facebook. Copyright © 2015 – 2018 made by marley. All rights reserved.